Hey Girl Scout Juniors: Have you earned your Geocacher badge yet? Here’s how one troop combined a Take Action project with their favorite pastime—geocaching! Cache In Trash Out (CITO) is an ongoing environmental initiative supported by the worldwide geocaching community. Since 2002, geocachers around the world have been dedicated to improving parks and other cache-friendly places. Geocaching is an activity that involves the out-of-doors and technology. “Caches” or containers with tracker logs are hidden at GPS coordinates and others try to find them for sport. At each cache, trackers can log that they found the cache and sometimes they trade swag—little trinkets left behind. 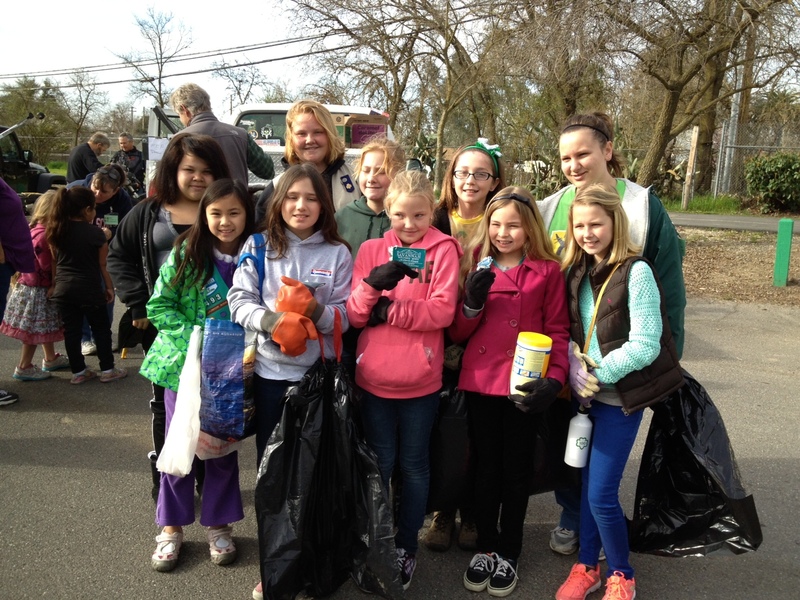 Girl Scout Junior Troop 845 has been geocaching for a few years and has attended other CITO events. When they noticed trash along a local bike path and creek, they decided to plan one in their own town. “Girl Scouts Giving Back.” With their leader’s help, they were able to post the event on the geocaching website to invite the public. On March 3, more than 100 geocachers and Girl Scouts attended the event—one person even drove in from San Jose, another Girl Scout troop came from Novato. Great job, girls! Want to be adventurers too? The Geocacher badge is in the The Junior Girl’s Guide to Girl Scouting. Geocaching tools are available for purchase at The GS Shop in Sacramento and Salida.